Music Used is at the bottom of the page! Guns now support custom models in JSON style. Guns now support full sound files, this means no more sound lag! Guns will now 'bop' in tune to the music, complete with zoom effect and a little knockback. Guns will now shake in your hand slightly, because it's hard to handle all that music. No more lazy right clicking to shoot, you now have to hold your right mouse button. This also means you'll be slower when shooting. If you decide to try this out, maybe because you just want to listen to the music, DO NOT drop the gun as the music is bound to the player. Well there is, but it's just 1 frame. As great as the new sound system is without the lag and all, too much other sounds can stop the music from playing. Custom packs currently not supported. Find any more bugs? PM me! Warning! This mod is still in beta, it is very possible that your minecraft crashes because of this mod, it is also possible that strange things will happen in minecraft! ALWAYS THROW AWAY YOUR OLD GUNS BEFORE DOWNLOADING AN UPDATE, THEY WILL CRASH YOUR GAME!!! DO NOT PUT PARTICLES ON DECREASED, IT WILL CRASH YOUR GAME!!! A gun can be fired by holding the right mouse button. It shoots musical waves as a particle while playing a tune. These waves explode on impact, with all kinds of different effects. The guns can be edited by a gun pedestal, so you can configure your gun. REVIEWS: I CAN'T BELIEVE HOW MANY THERE ARE!!! The new version is aimed at the synchronisation of rhythm and shooting of the guns. Simply put, it's gonna make your guns shoot in the actual rhythm of the music. Beware though, because of the way minecraft runs, this is very prone to lag, and in my experience can often be off-beat, but it's at least a start. I've created a simple system for this, for which I have currently developed a (yet unreleased) tool, for future pack creators. The next version is bound to be 1.0, 1,1 will feature a lot more pack support and some friendly programs for people to make plug-in-packs for the mod. A new object has been added, it is still a WIP but it's main functionality is there. 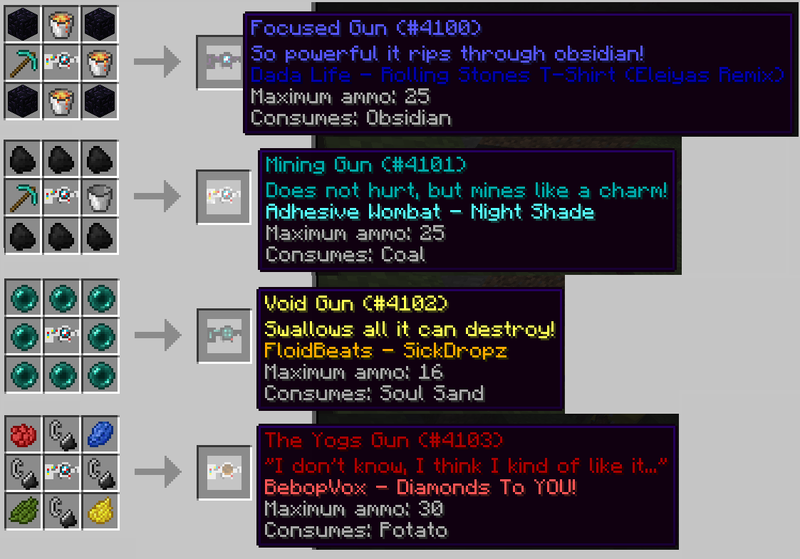 It allows you to insert any crafted guns into it, and will then remember its attributes! then you can put a gun in and cycle through the stored attributes by clicking the buttons. This allows you to modify any gun to your favourite. 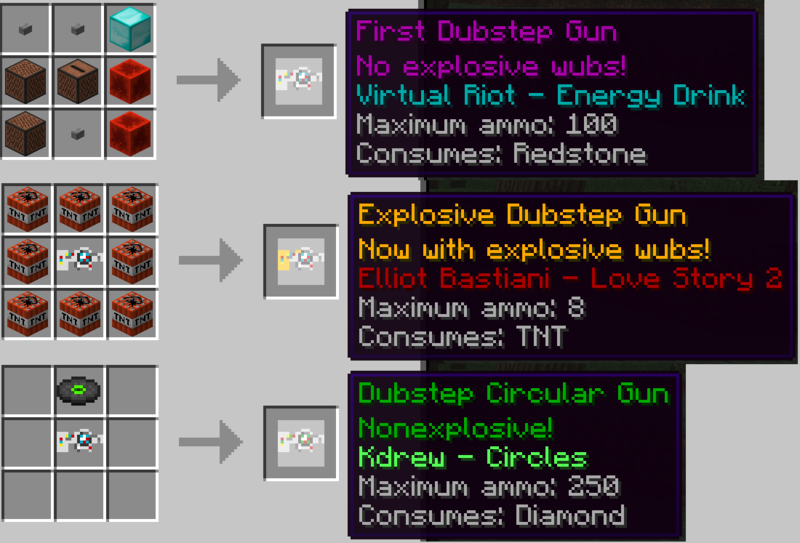 the pedestal, and upload the explosive attribute back to the first dubstep gun. it back to your favourite gun! There is not yet any penalty to switching around the attributes of your guns, this is planned though. A lot of the ammo has been changed. there are now 4 (in 3d) and the particles dissapear much faster, creating a much better looking 'wave' effect. the gun moves a bit when shooting, you also move a bit when shooting now. The option to deal damage to entity's such as players, drops and animals. And to play with these options, 4 new guns have been added! This gun has very high explosive range but low damage, great for killing caves of annoying bats. The guns have their own creative tab now! 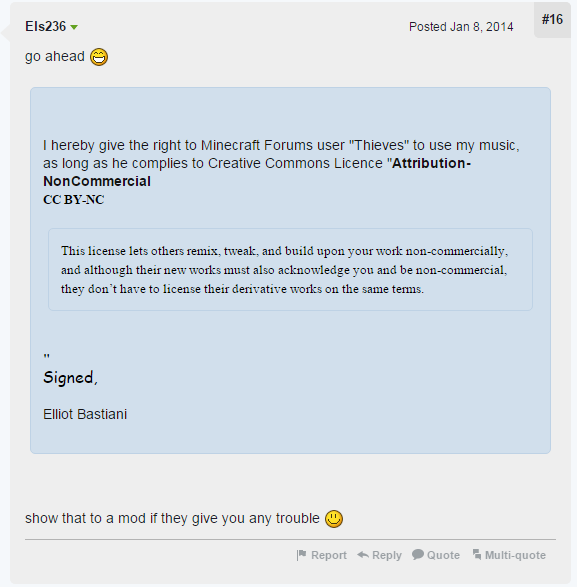 +Version control, if there's a new version, minecraft'll tell you! New and improved, make your own pack system! Most packs will not work until a full release (1.0) is made, because they are still bound to versions!